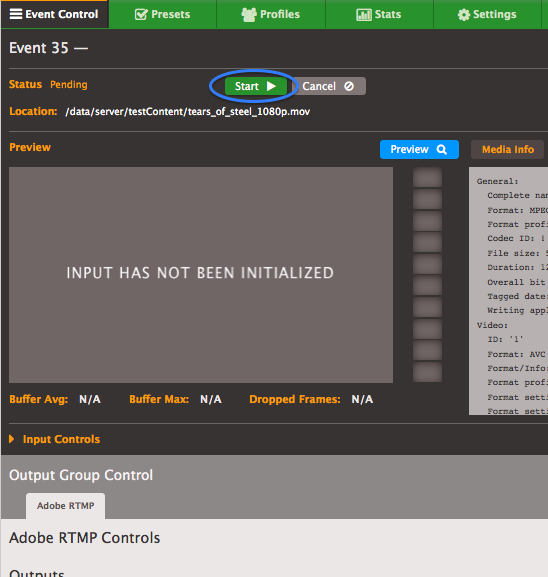 You can use your Elemental Live encoder to stream to IBM Watson Media via the Adobe Flash RTMP output group. These encoders are great for their reliability and for the ability to send multiple streams to different locations from the same encoder. Log in to your IBM Watson Media account, or create a new one if you don't have an account yet. Click on your user icon in the top right of your screen and click on Channel Settings from the drop down menu. Click on the channel you want to stream to and then click on Broadcast Settings. 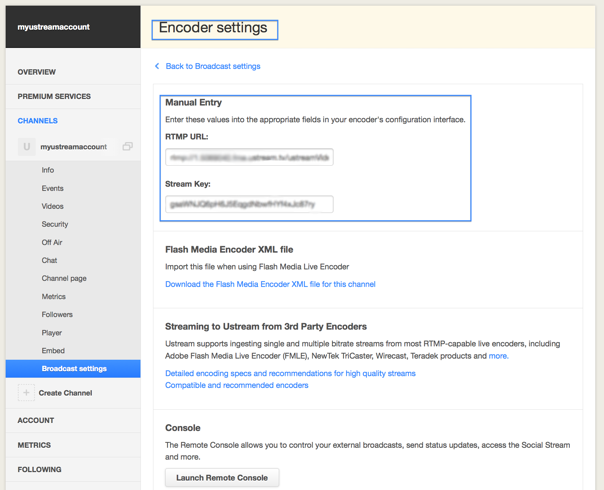 Click on the Encoder Settings. Notice the RTMP Address and the Stream Key from the Encoder Settings page. Keep this tab open and proceed to the next step. You will need this information shortly. 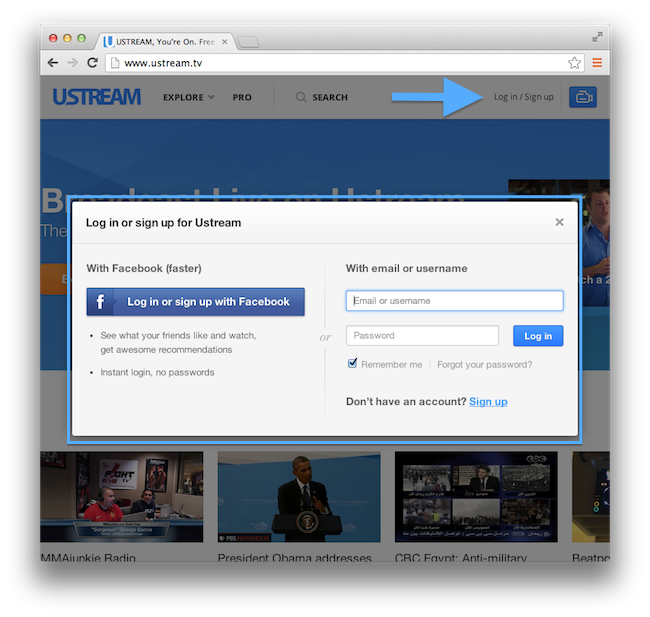 Login to your Elemental by entering its IP address in a web browser. Create a New Event under the Event Control Tab. Select the Input as HD SDI or File Input. For this demo I will use a file input. For testing the Loop Source option is helpful as it will make it so the encoder always has content to encode. 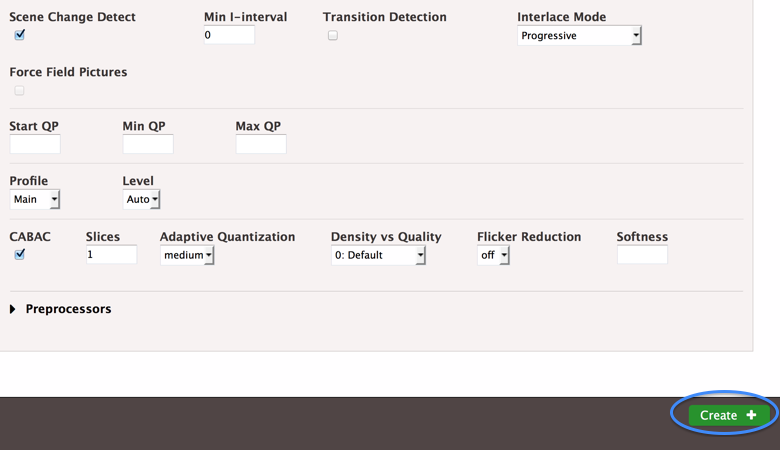 Under New Output select any of the H.264 HD / SD Presets in the Web (Flash/Silverlight) Section and then select Add Output. Go to the tab you opened above with Encoder Settings for your Channel page on https://video.ibm.com. 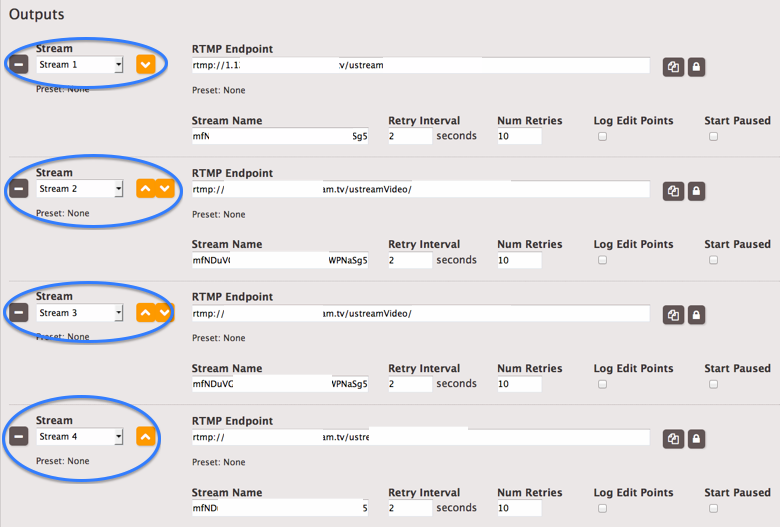 Under Output Enter your RTMP URL in the RTMP Endpoint field in the Elemental. Enter the Stream Key in the Stream Name field in the Elemental. Under the Advanced tab you can adjust the detailed encoding presets. It is important to change the GOP Size, also known as the Key Frame Interval. Since we are streaming at 30 FPS we want 60 Frames for a 2 second Key Frame Interval. 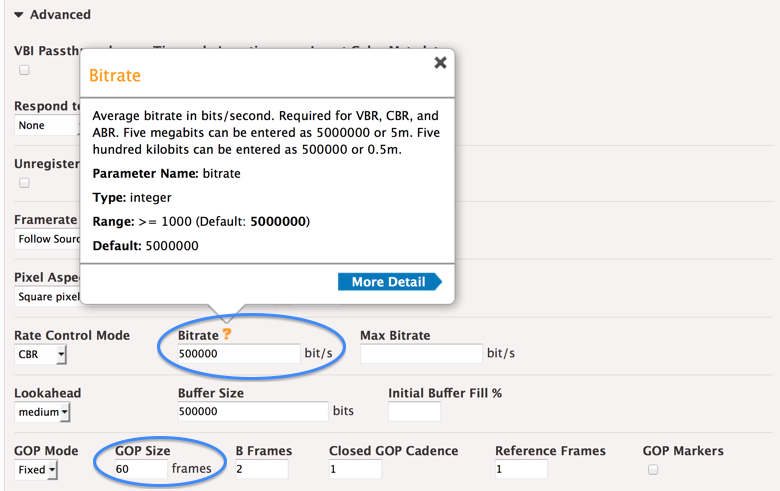 Also pay attention to where to change the Bitrate and notice how it is listed in bits per second. Click Start to start the encoding. The preview will display the output from the Elemental. You can now watch the broadcast on the IBM Watson Media channel page or embed. The Elemental is capable of sending multiple quality streams to a single channel. This is done with the following procedure using a single Elemental Event. Use one output per stream quality you want displayed in the IBM Watson Media Player (up to 4). 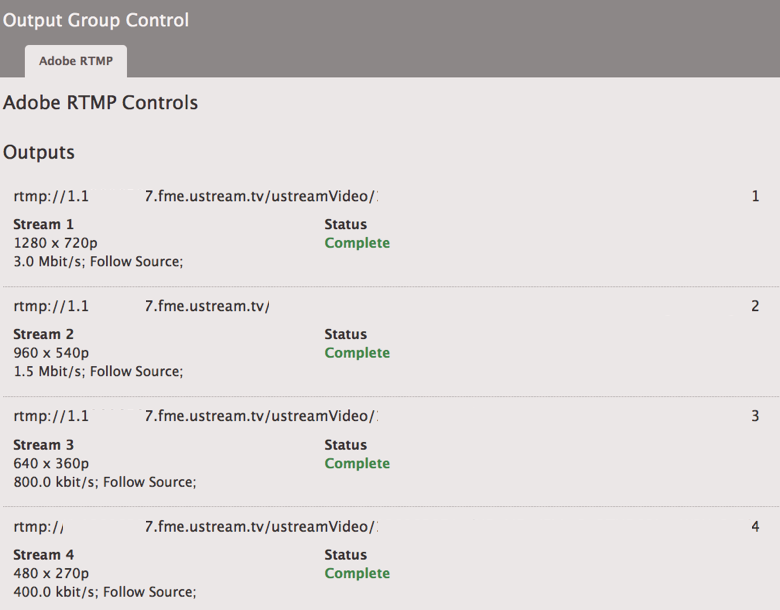 The RTMP Endpoint is the same for each output because all the streams are going to the same channel. On the end of the Stream Name put a 1 on the end of the highest quality stream, 2 on the end of the next highest quality stream up to 4. Make sure to put the number just after the Stream Key and do not add spaces. 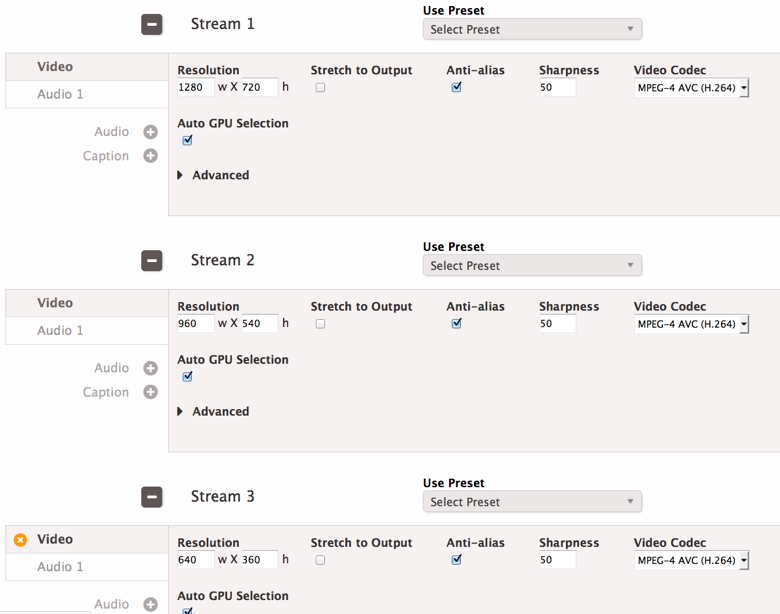 Make a stream for each quality with the highest frame size as stream 1, next highest stream 2 etc.